1x T10 bulb Multivoltage, this can operate from 8-30v dc. 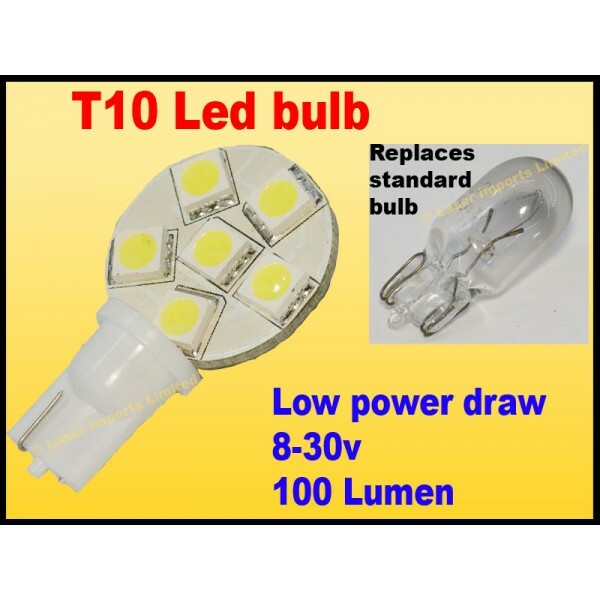 It replaces the common T10 or 5w5 halogen bulb found in many boats, yachts, busses, campers, caravans, Rv's. This low power bulb only draws 1.3W so you can leave it on all night with out worrying about your battery going flat. This is great for freedom camping. It puts out about the same amount of light as a 10W halogen bulb. Some light fittings are smaller than others, You may have to remove the reflector to get the bulb to fit, this will not effect the performance of the light.